How do you use the AdultShader Effect in MMD? What is the AdultShader Effect for MikuMikuDance? Where do you get the AdultShader Effect? LearnMMD MME Tutorials. Why can’t you use the AdultShader Effect on Lat models? 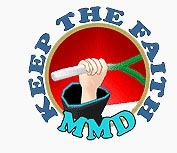 We recently started a FORUMS section here at LearnMMD (The link is on the green bar at the top of the page). One of the questions that came up was how to use the AdultShader Effect. We strive to help our readership as much as possible and the forum section is another tool for this. So please use our FORUMS if you have any MikuMikuDance related questions. These topics can easily become articles. You can download the AdultShader Effect at this mediafire site: http://www.mediafire.com/?54g9j8ehx6z0t9d What the AdultShader effect does is darken the shadowy parts of your model and enriches the colors and textures of the model. Some people have mentioned that the models look more “ripped.” This effect is different than most of the effects we’ve written about, in that you don’t have to go the Accessory Manipulation Panel to load it. Load all your model, motion, wave data files. I would also recommend going to the main menu; choose view and turn the model’s “thickness of edge line” all the way to 0. Click your MMEffects button (See Noko2’s article about downloading and installing MME for MikuMikuDance) at the top right of your screen, select “Effect Mapping.” Another window will open up with a list of all the stuff you’ve loaded. Select your model’s name and then click on the Set Effect button. Now find your AdultShader file and double click on the effect and then click OK. That’s it, you’re done. Whenever you search for information on the AdultShader Effect, you almost always come across the obligatory mantra “Never use on Lat models! Never use on Lat models!” It has become the MMD equivalent of the Bloody Mary myth (Notice, I didn’t say “Never use on Lat models” for a third time-Oops!). Well, I did. It’s rather hideous and not for the faint of heart. It isn’t the worst thing I’ve seen in MikuMikuDance though. The .gif to the right shows the same Lat Yukata Miku model without and with the AdultShader effect. This is a beautiful effect and definitely worth keeping in your MMD tool box. It adds depth to your animations. Remember you want your videos to stand out and every little tweak will help out. Models: Neru and Yukata Miku by Lat. ReYaMa090 Lat Secret Data Miku. Load all your model, motion, wave data files. I would also recommend going to the main menu; choose view and turn the model’s “thickness of edge line” all the way to 0. Click your MMEffects button in the upper-right of your MMD screen, select “Effect Mapping.” Another window will open up with a list of all the stuff you’ve loaded. Select your model’s name and then click on the Set Effect button. Now find your AdultShader file and double click on the effect and then Lat Yukata Miku without AdultShader Effect and one with.click OK. That’s it, you’re done. I sent you an email … but the info you seek is in the middle of that article … use the Effect Mapping window that is available if you click the MME button on the top right of your MMD screen. Oh darnit, I was about to make an article on that (about LAT and Adult Shader)… But since nobody really replied except for Arizona, I guess I still can, because the LAT thing isn’t too well known. Our readership, we authors, LearnMMD all benefit from this peer oversight.